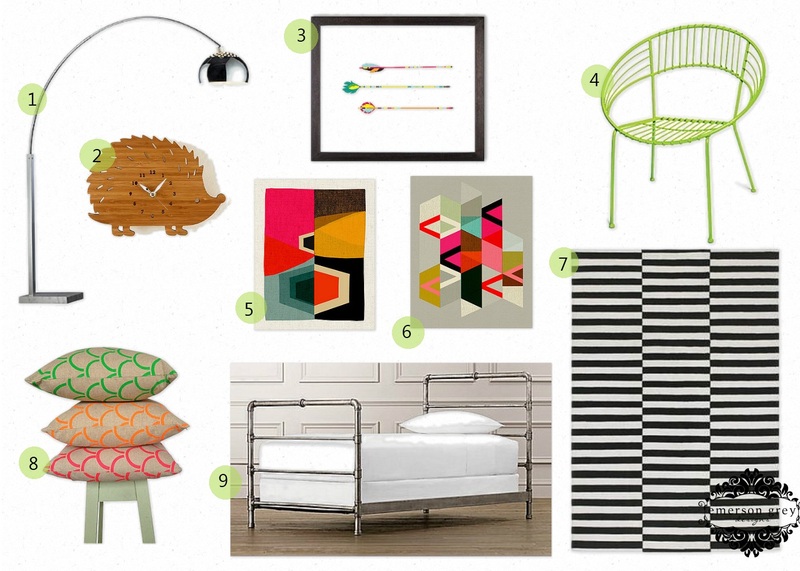 I’m loving the rise in geometric print bedding. Whether it has an Aztec, modern or playful feel, it is so fun to see. I love how it adds movement and visual stimulation. This isn’t ideal for a nursery, but it can be great for the big kid in your life. And even better for the tween. Gone are the days of gingham as the only pattern available amongst the solids. Here are some of the sets I’m just drooling over. The Isleta Duvet cover from Anthropologie I just love because of its neutral palette. And the touches of coral soften it for a girls room perfectly. And this John Lewis Mosaic duvet is just perfection. Amongst this simple room, look how it adds just the right bit of color, fun and interest. Love!!! One of my favorite sources of geometric bedding is Urban Outfitters. They really understand the newest trends and present them in such great colors. And here is an example on how geometric bedding can be subtle and still make an impact. I think this Magical Thinking Triangle Chain duvet would add just a great touch to my ‘Neon’ board below. You can find the original post for this design board along with all the sources here.